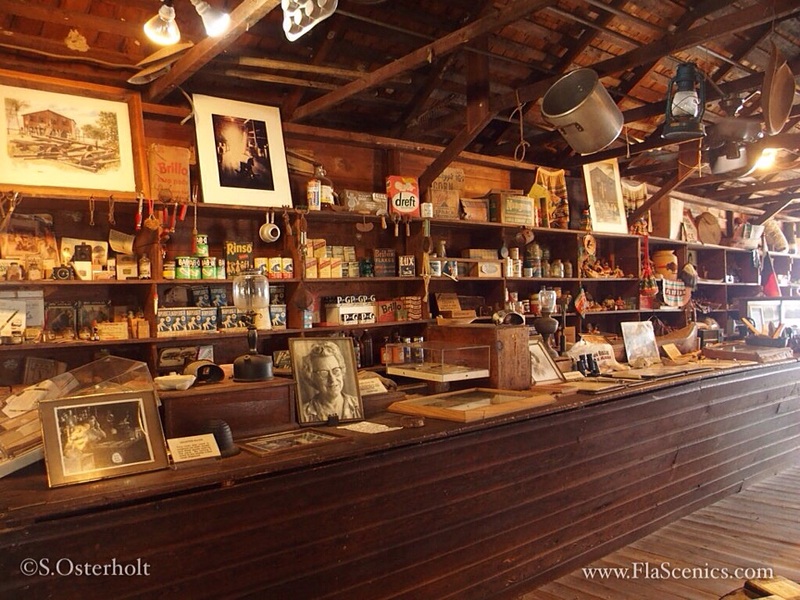 The Smallwood Store, was originally trading post established in 1906 by Ted Smallwood for settlers to trade fur, and farm produce, in exchange for basic necessities to survive the harsh environment of the everglades. 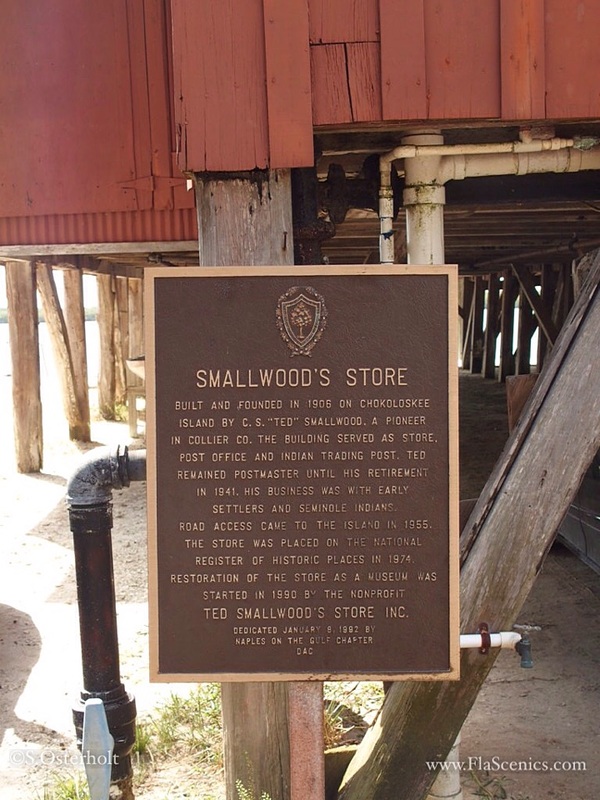 Store was closed in 1982, and in 1990 Ted’s granddaughter, Lynn Smallwood McMillin, reopened the store as a museum with the goods that were left on the shelf in the store. A step back in time for sure! 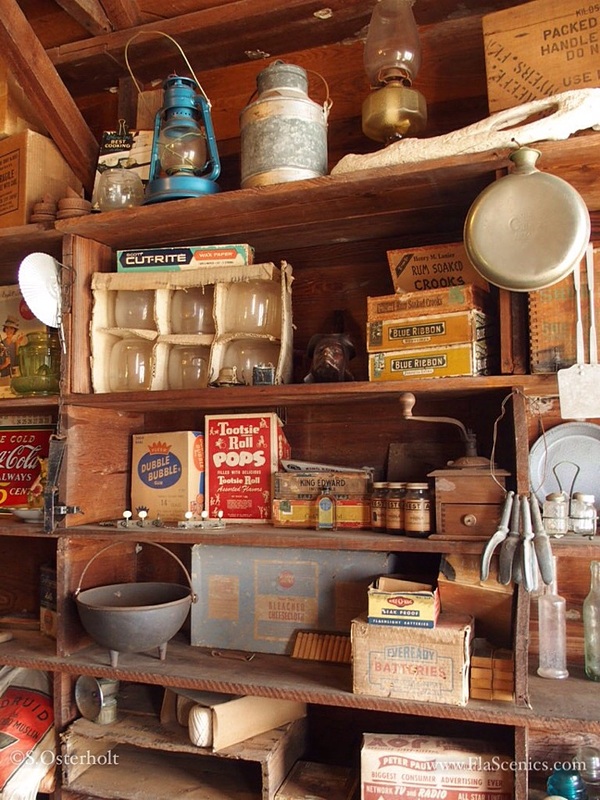 Many of the goods and décor date back to the early 1900’s. 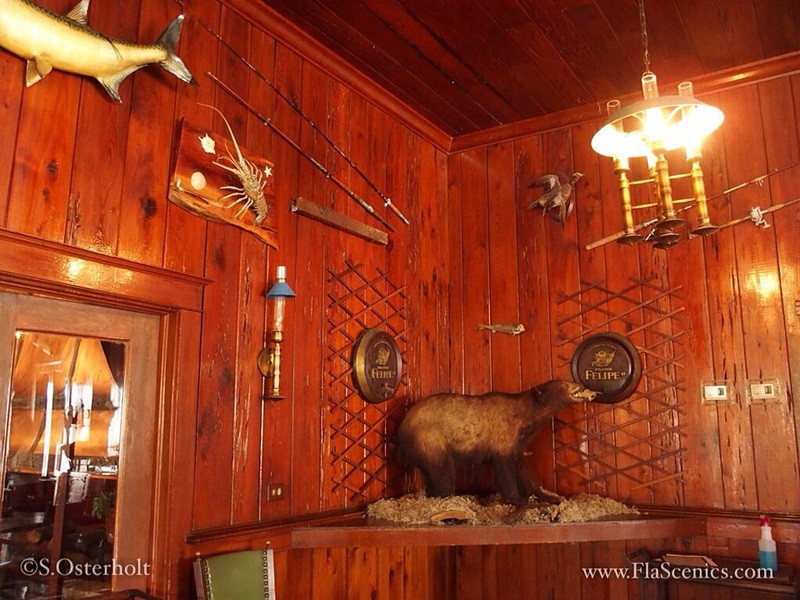 This is another must stop in South Florida just like my previous blog about the Rod and Gun Club. 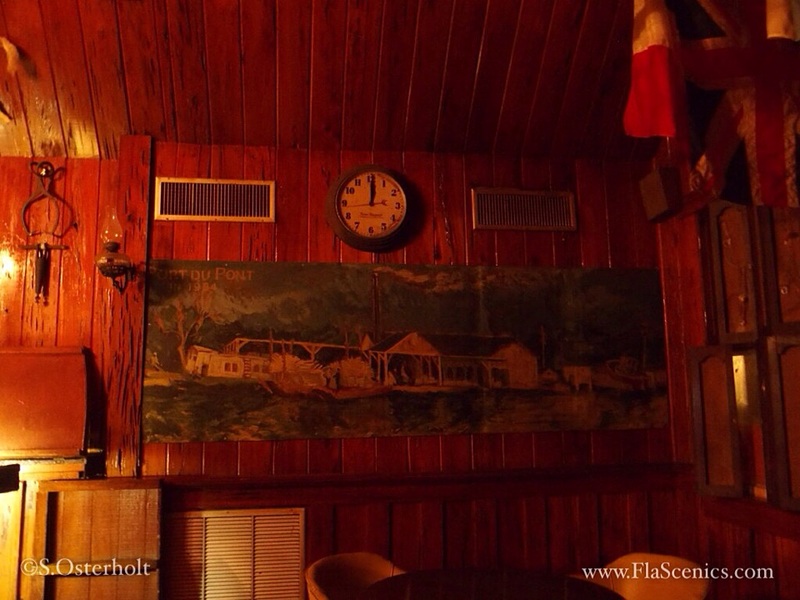 There are so many historical “Old Florida” things here, it is almost impossible to absorb it all, including lots of vintage Florida Fishing History. To take a stroll through the store is walk back in time, and I will try to share this trip with you some great photos my wife Sharon shot throughout the store. More store décor, keep in mind this was not added, this is original store stuff! As wonderful as the store is, it is presently going through some hard times right now. The store and the owner Lynn Smallwwod-McMillin, are involved in a legal battle with a developer over the access of the only road that leads to the store. 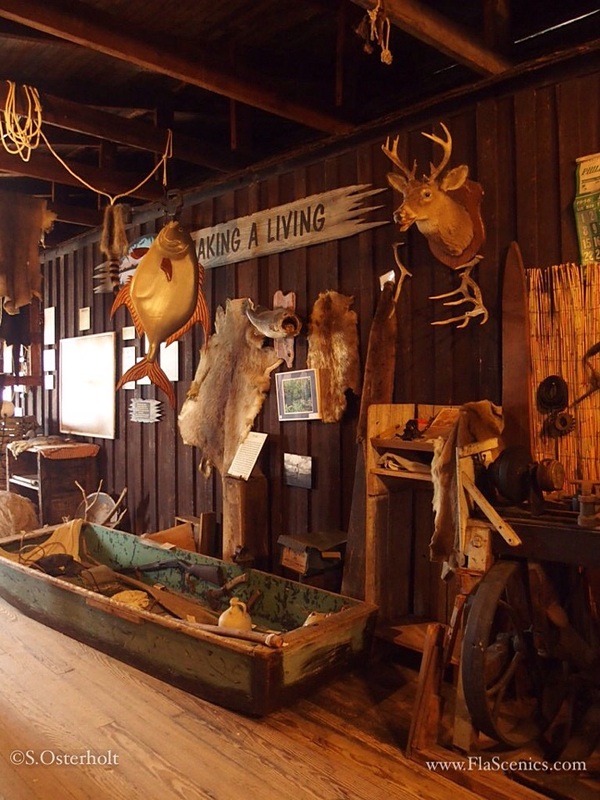 The store/museum was actually shut down for 6 months back in 2011. 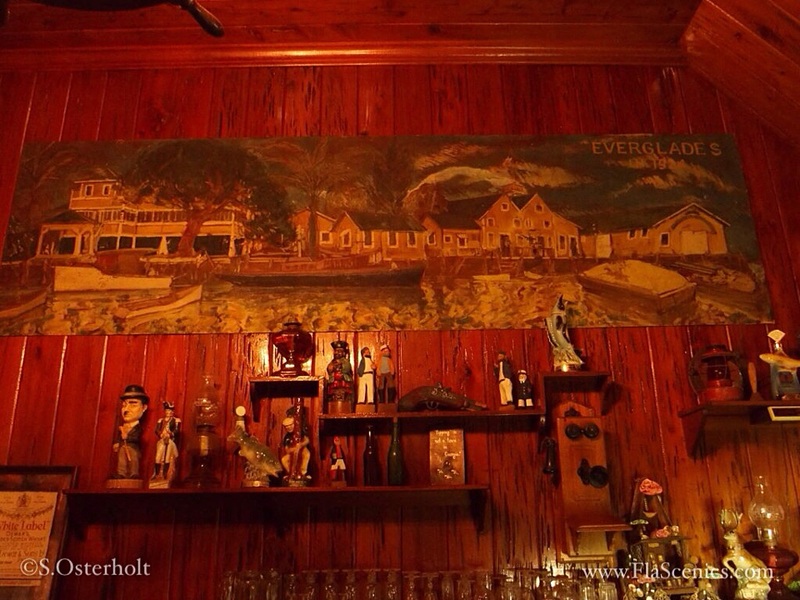 The legal fight continues, and hopefully this wonderful piece of Florida history will be saved. You can read about the history and the legal woes here in this NY Times article form July of 2014. 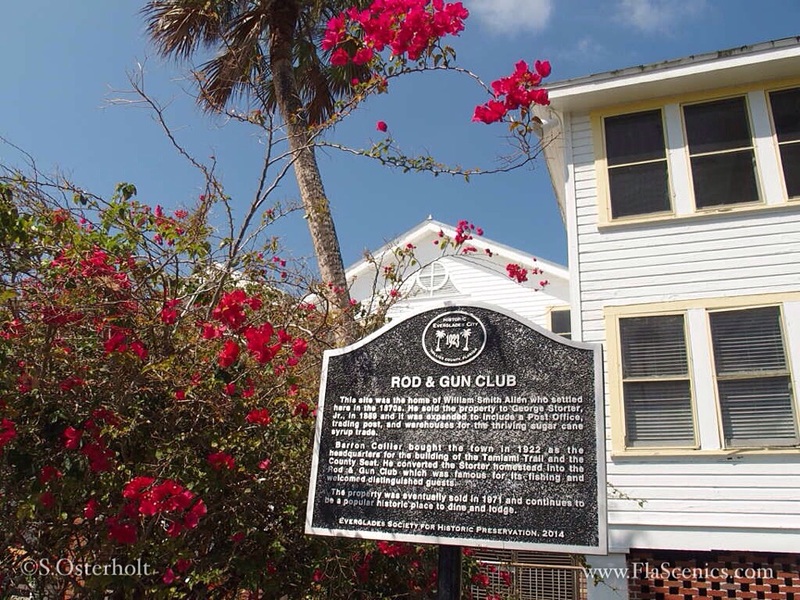 If you ever get to South Florida, and you enjoy the way it used to be, you need to schedule a trip to Everglades City to see the Rod & Gun Club. 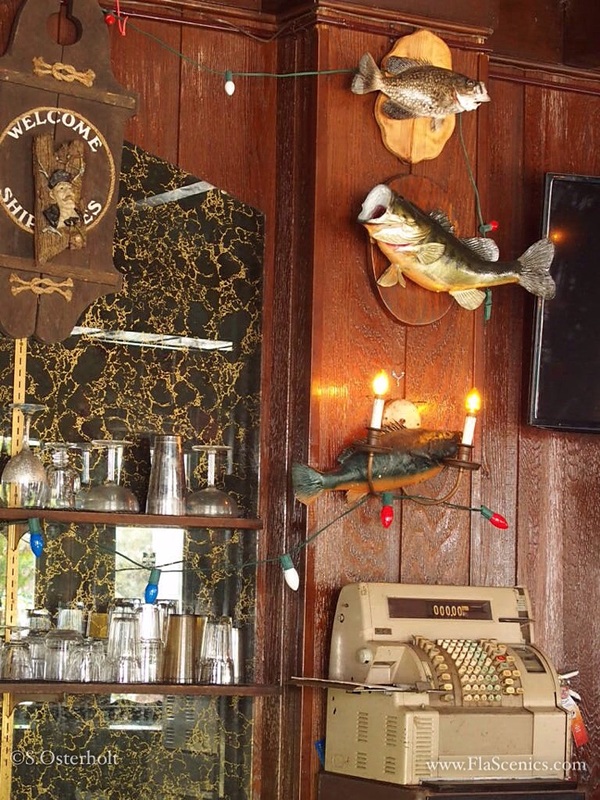 Nestled at the end of the road, it is like you are traveling back in time as you drive south on highway 29 until you can’t drive anymore….. 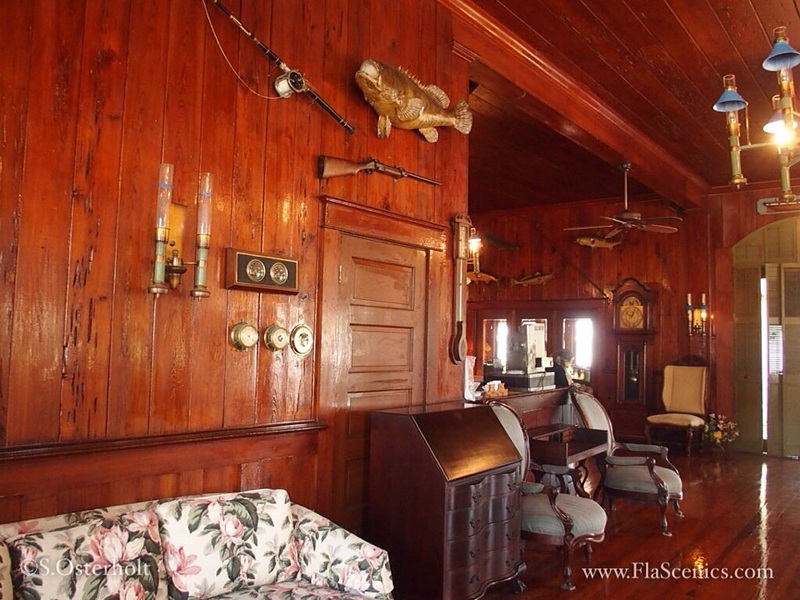 Originally constructed in 1864 by the first settlers here, it was purchased by the wealthy Barron Collier, Florida land baron, in 1922. 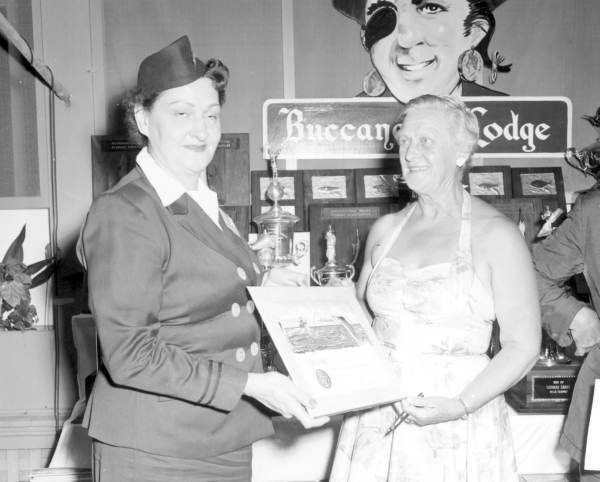 The lodge survived Hurricane Donna in 1960, and a fire in 1969. 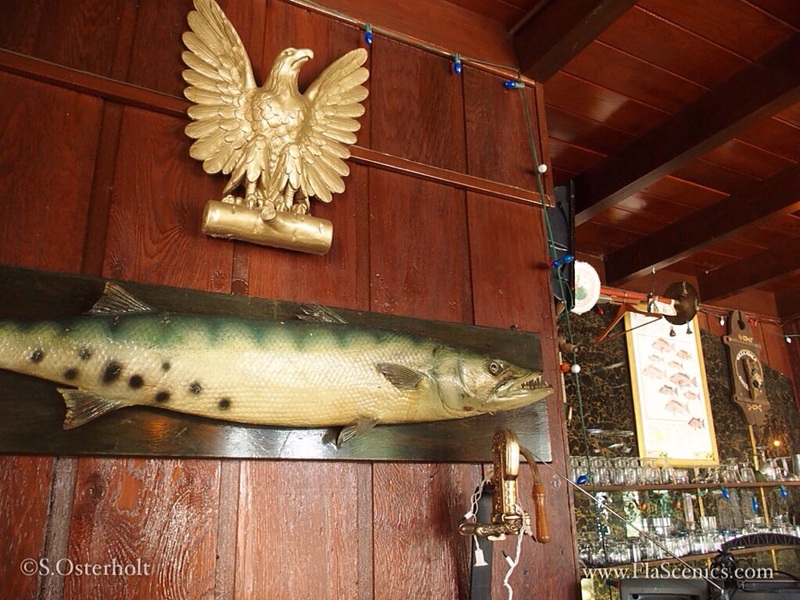 In 1974 it was rescued by the current owners, the Bowen family, who have kept it as it was, a thriving club for the wealthy hunters and fisherman from the 20’s through the 60’s. Here are a few views of the outside, wait until you see inside! 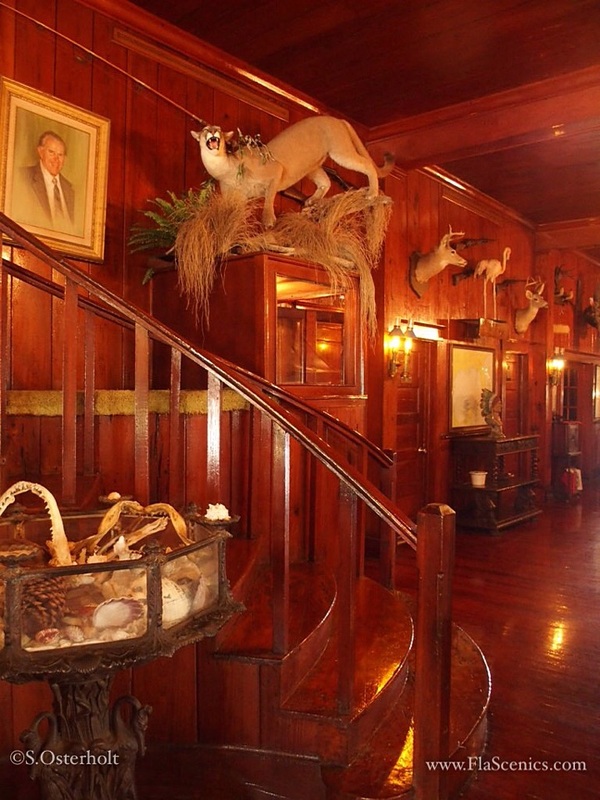 It has been visited by 5 presidents, and many other rich and famous guests like Ernest Hemmingway, John Wayne, Bert Reynolds, Sean Connery, Mick Jaggar and many others. 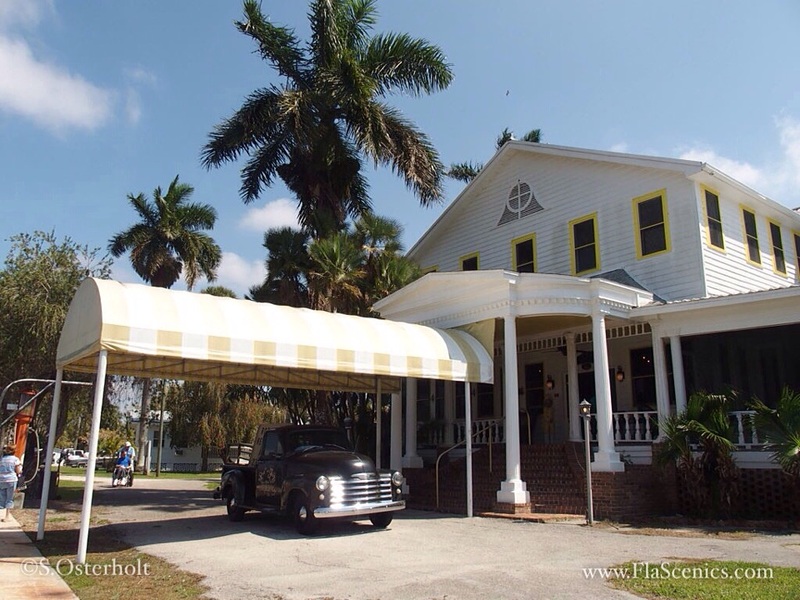 If you are looking for what the locals call “Old Florida”, nothing can compare to this! 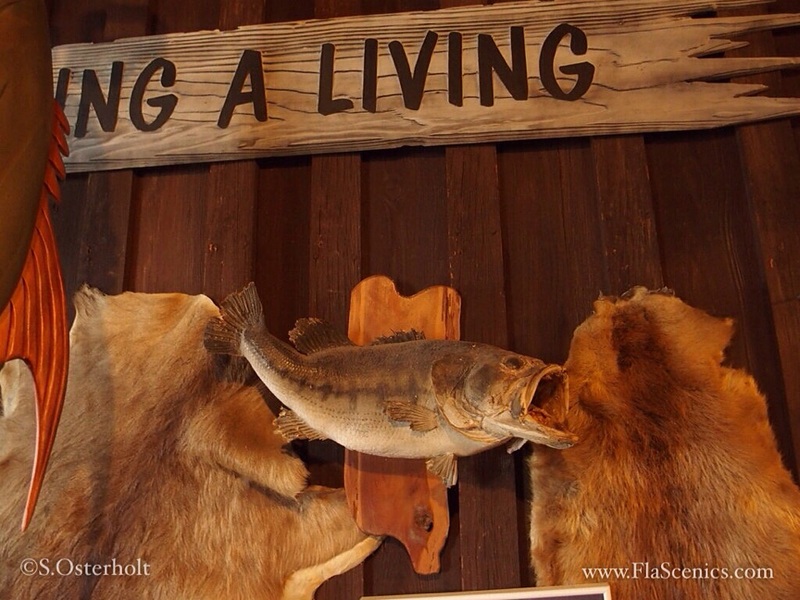 As a fishing tackle collector, this is our Disney World! 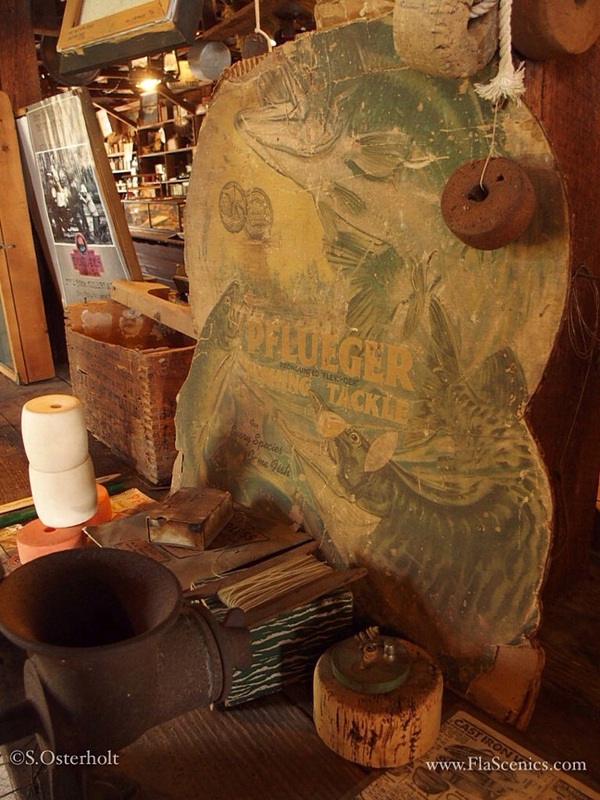 Now if you love antique tackle, you have to see this! 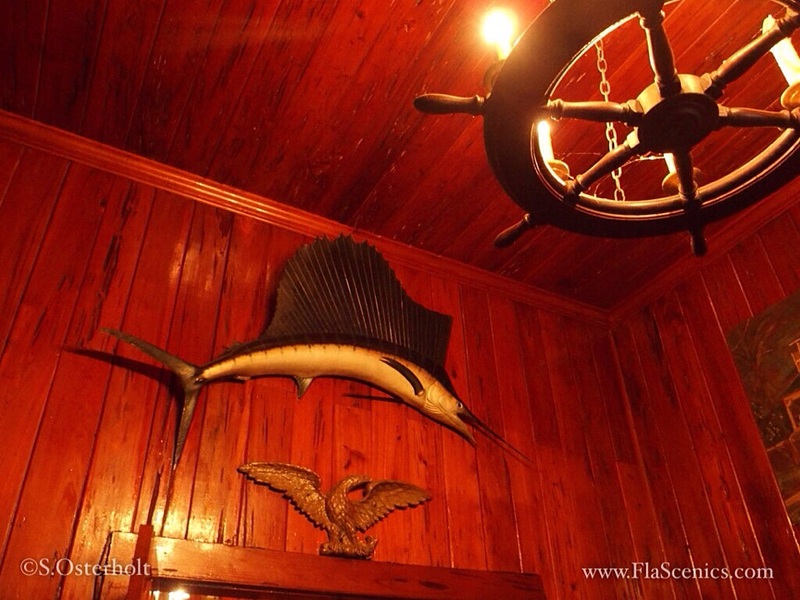 Take a look at the panther and the marlin! 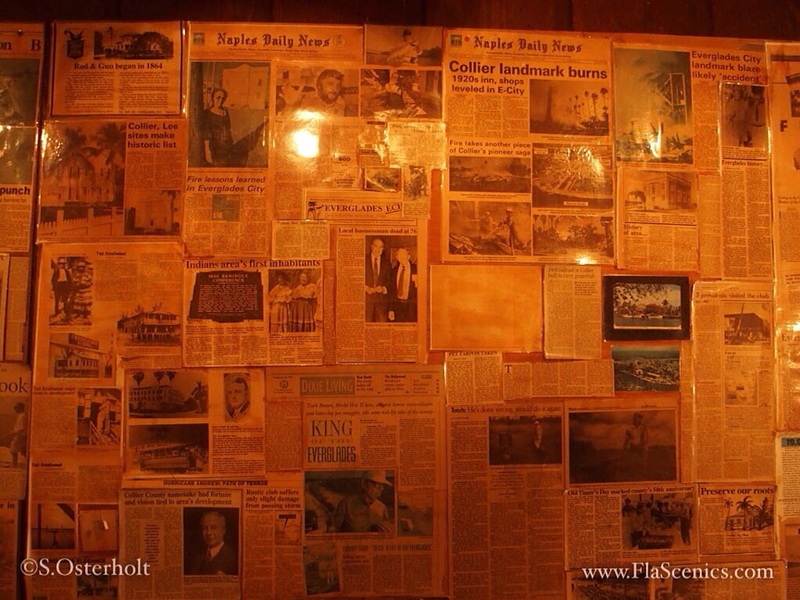 The old newspaper articles capture the history. A few more parting shots. 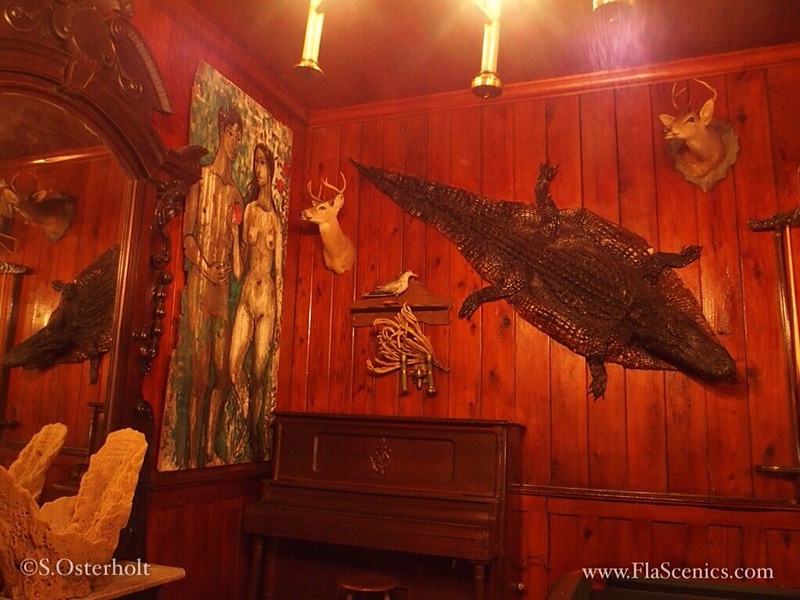 If you enjoy “Old Florida”, make sure you put this on your bucket list. 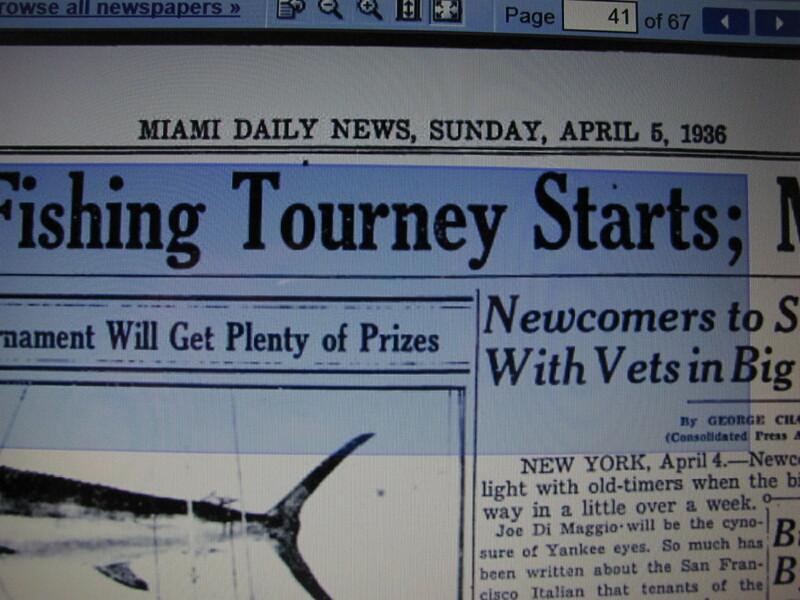 That was most likely the thoughts of a lot of the contestants in the annual Leesburg Florida National Bass Tournament of 1933. 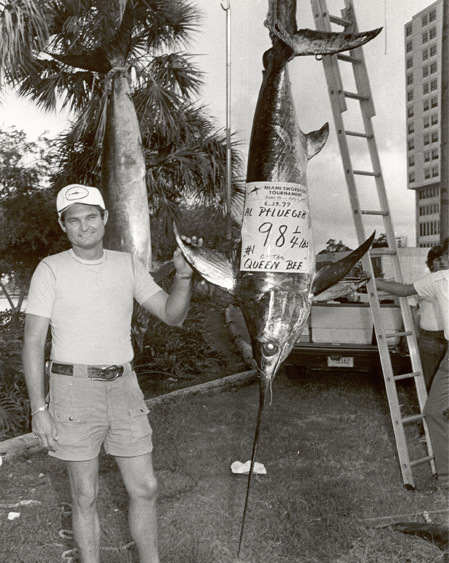 J.B. Schick was the dominant player in the early years of the event, capturing the largest fish to date. However in 1933, things would change. In that year, some the rules had changed from previous tournaments. Now, Florida residents could participate in certain categories and win prizes as well. RL Stevens from the fire department was the official weigh-master, and all fish had to be weighed on the fire department scales to keep it fair. 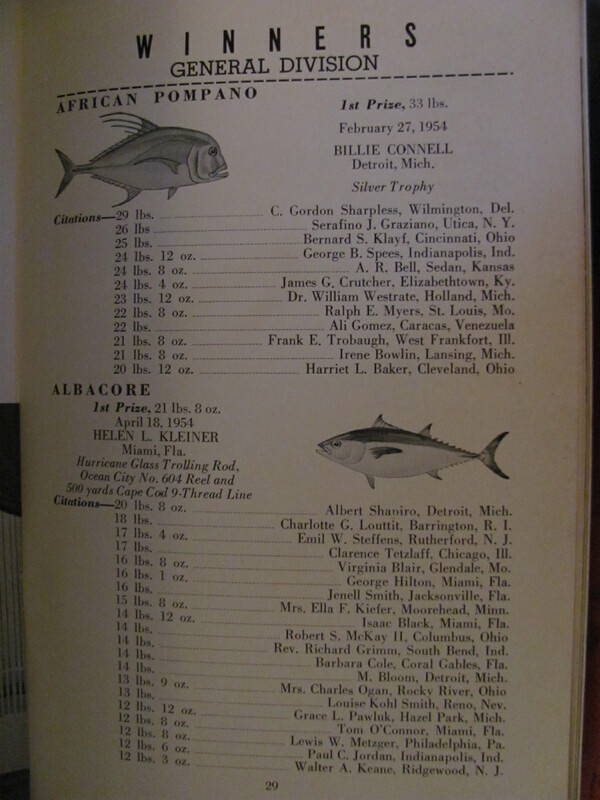 The tournament had some major sponsors in 1933 as well. The sponsor list included: The Builders of Leesburg, First national Bank, the Magnolia Hotel, Lakeview Hotel, and Harris Hardware. 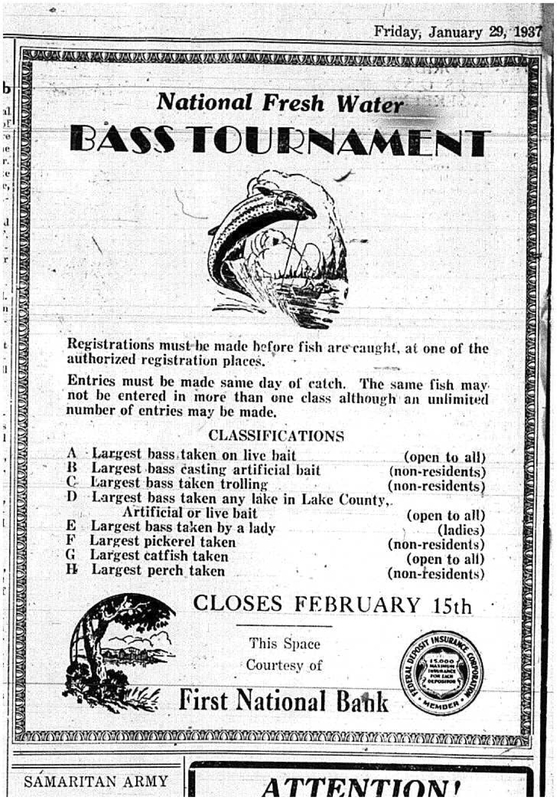 The tournament lasted 2 months, from January 15th through March 13th, and contestants could fish as much as they liked, but were contained to the lakes that resided in Leesburg; Harris, Griffin, and Silver Lake. 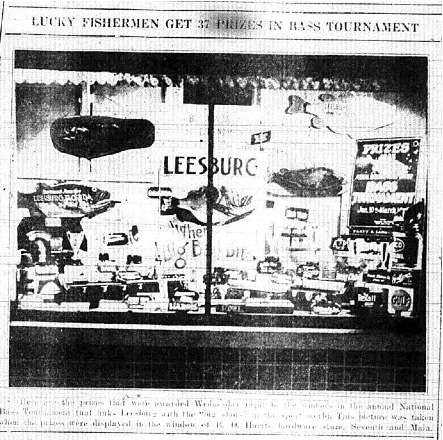 Charles Abele was a longtime Leesburg wintering resident, and did most of the promotion for the tournament. Mr. Abele got national attention, and pulled the best anglers from all over the Northeast and Midwest. 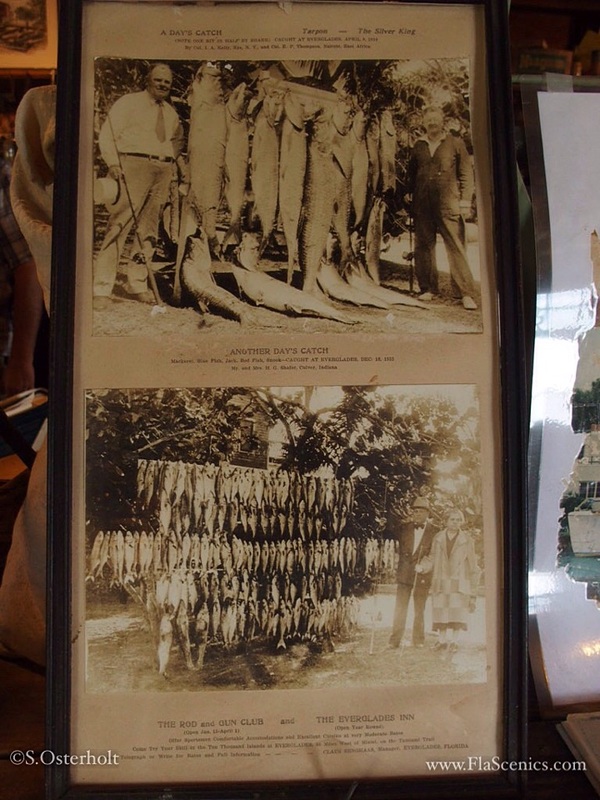 J.B. Shick was one of the “big name” fisherman from LaPorte Indiana. Shick had caught the largest bass in the in the history of the tournament, a 12 pound 8 ounce gorilla in 1928. 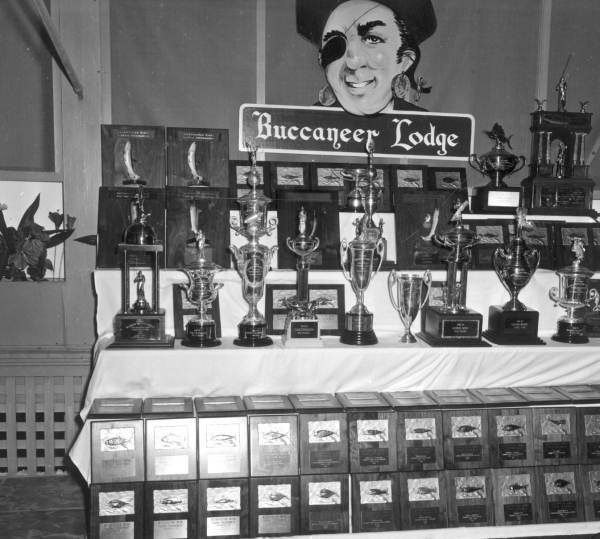 Schick competed every year and was well known amongst all the anglers competing. The grand prize for the tournament was the envy of all the participants and local enthusiasts……the infamous “Silver Cup”. 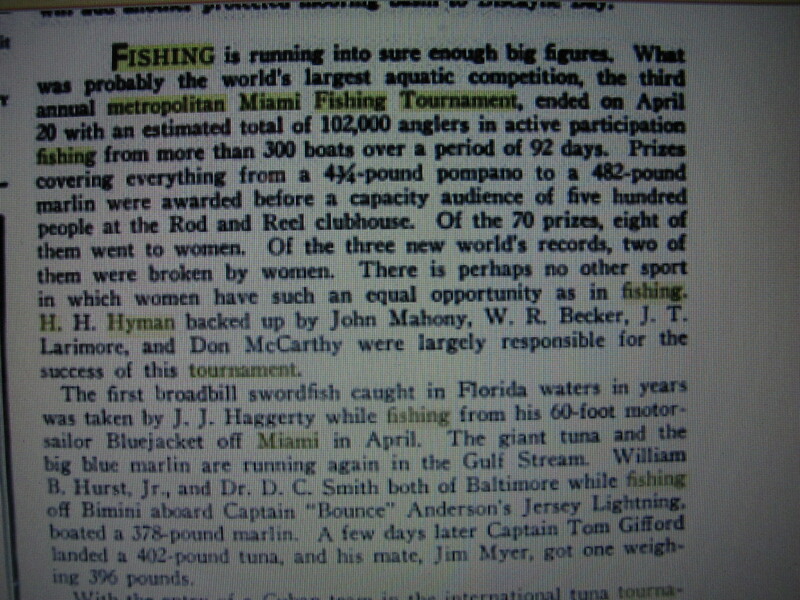 Shick had his cup, and another noteworthy angler named T.H. Farmer from Martin Tennessee, was hungry for his. 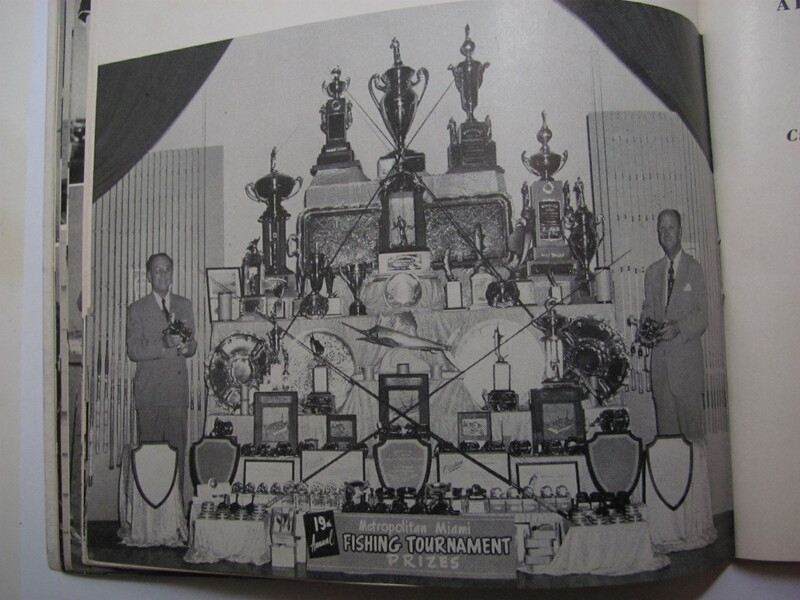 Farmer had fished all 5 of the events since the tournaments inception in 1928, and came within 6 ounces in 1932 when he was edged out by George Miller on the last day. Most believed that headline, since no one had come within 2 pounds of the two Floridians that were in the lead. Farmer was more determined than ever on that final day. He was at his boathouse at 5 AM and was ready to give it one more try. 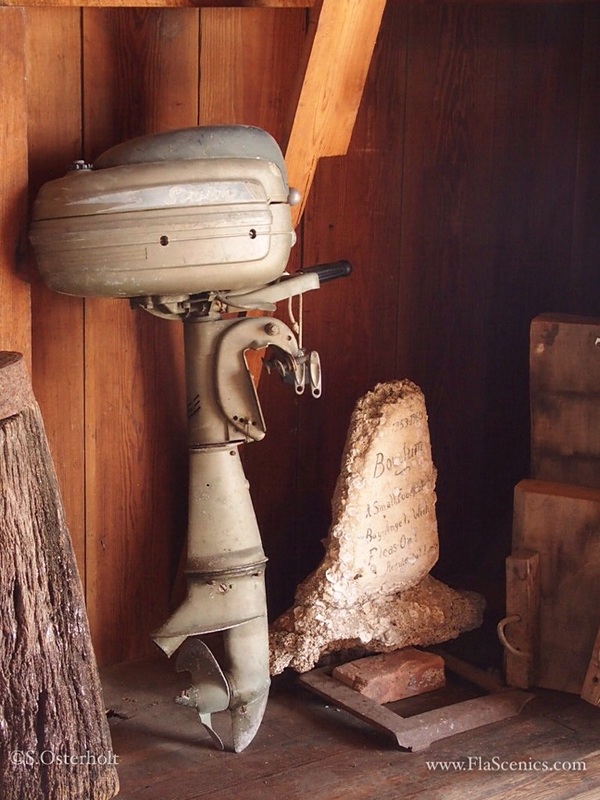 But…… as fate would have it, his outboard would not start……. He called the local mechanic and finally got the motor started at 10:30 and was off to give it his best shot. Farmer did the impossible that afternoon. He came to the Fire Department scales with a behemoth fish of 12 pounds 15 ounces, eclipsing Shick’s record, and taking the Silver Cup! Farmer indeed proved that when stricken with adversity, and with pressure on the line, that all you can control is the lure on your line…… and having patience and determination will win out in the end! 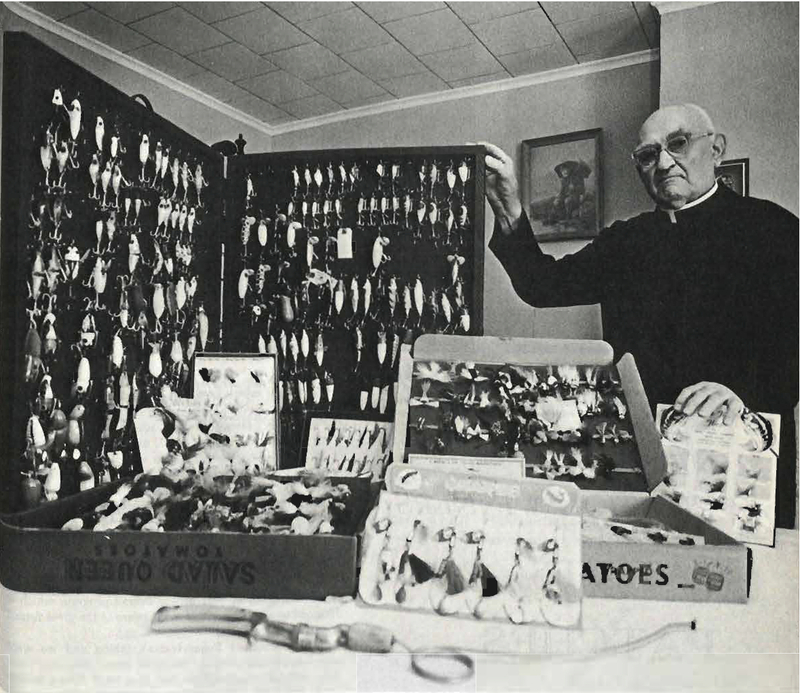 Father Lawrence Zakrevski should be considered the “True Father” of antique fishing tackle. Born in 1884, in Asian Russia, he came to the US in 1903 as a Consulate Secretary. He made his way to Pensyvania from Sioux City Iowa, and became a Catholic Priest. 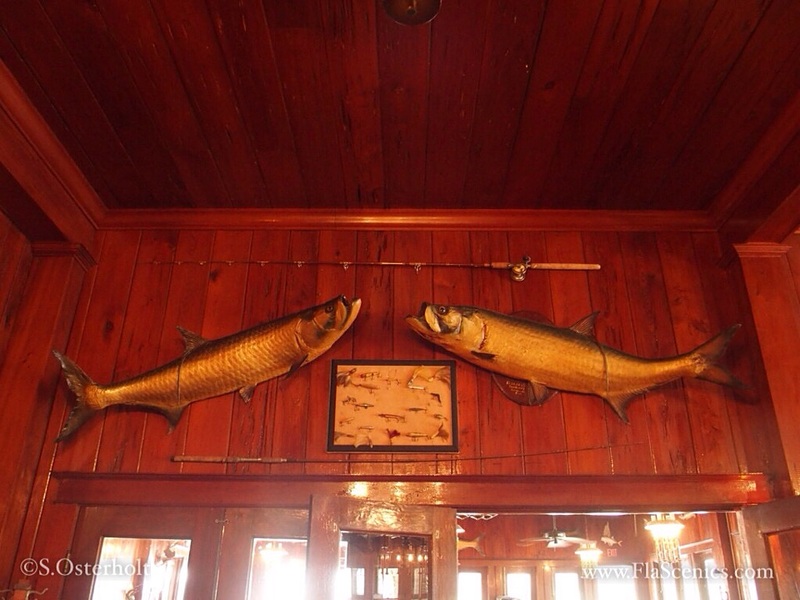 In 1914 two parishoners asked him to go fishing, and after that he was hooked! 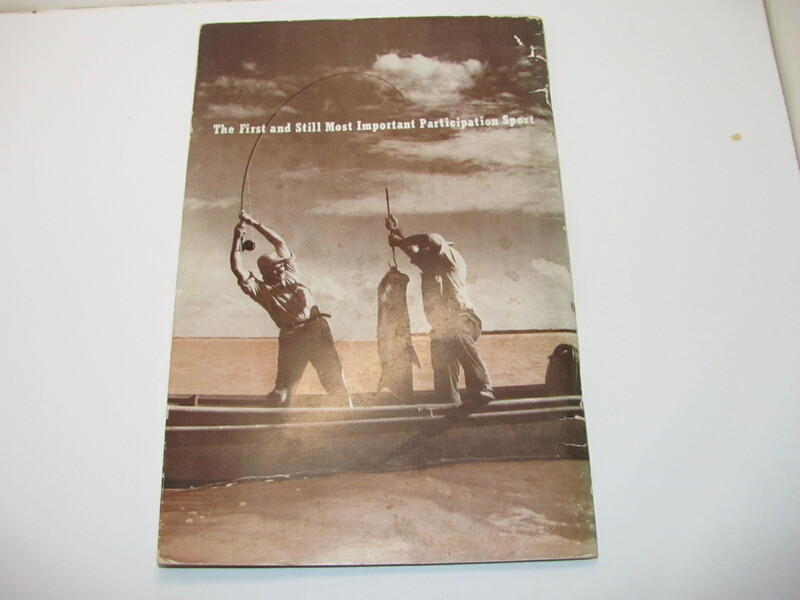 He started acquiring lures in the teens, and by 1939 he had over 10,000 lures and hooks! Can you image, the type of collection he must have had at that time with his newest plug being late 30’s! 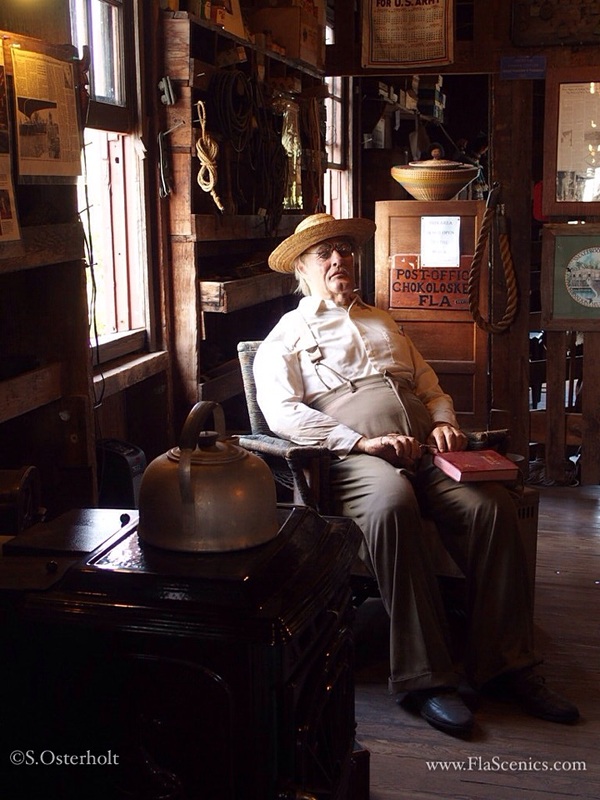 What a treat it would be to go back in time to 1939 and to view Father Z’s collection with today’s knowledge. 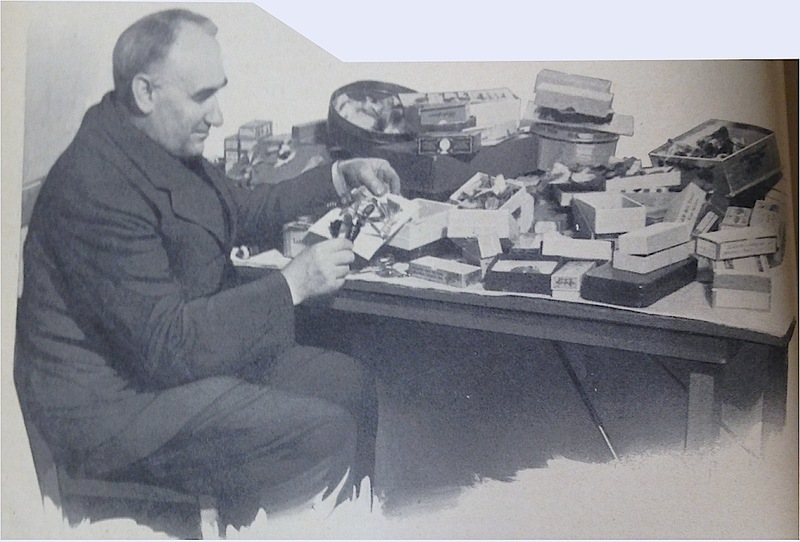 From an article in the July Fishing Special Edition of the 1939 Outdoor Life Magazine, we can gain a little insight into his collection in 1939. His collection was well know at the time, and 1300 people traveled hundreds of miles to see his lures in a spring open house. 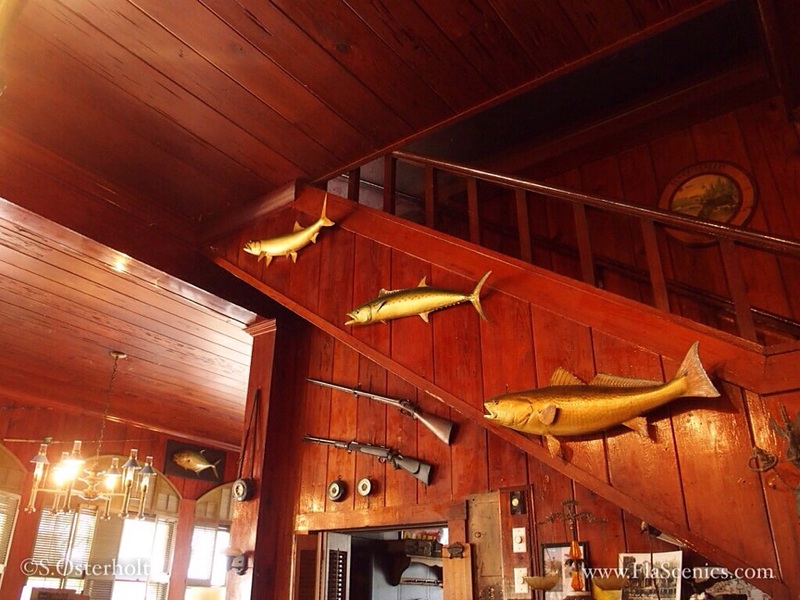 Lures were scattered about his house in Mt. Carmel Pa, and kept in moth proof containers and boxes. 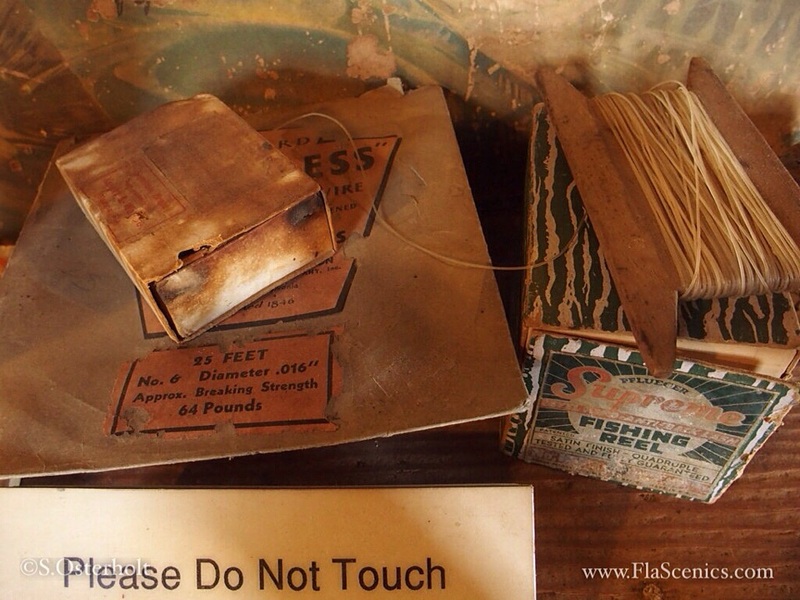 He kept a record book of all his lures, and cleaned and cataloged them. Sound familiar to today’s collectors? He was a man well ahead of his time. 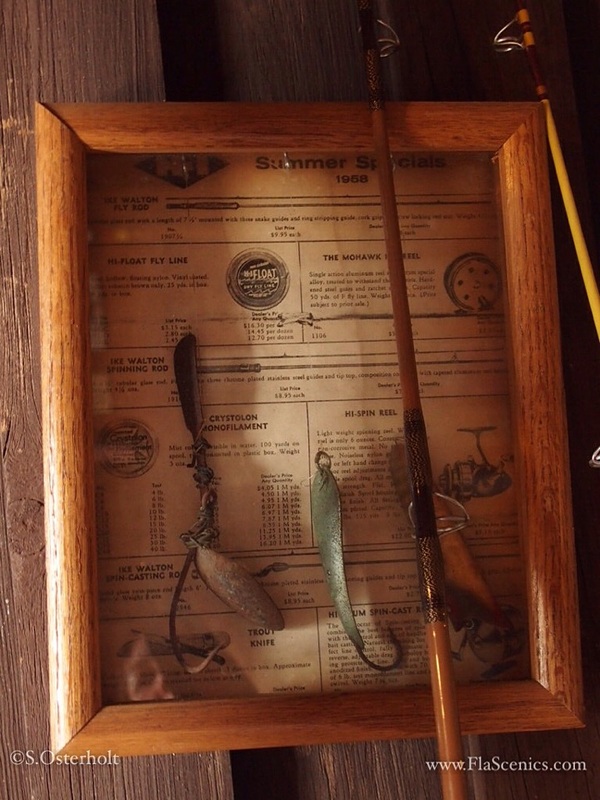 His collection included mice, wood, lures, metal baits, and lures from almost every state and Canada. About half of his collection came to him by donations, and the rest he picked up on his own. He was offered $2500 for his collection in 1939, and turned it down. 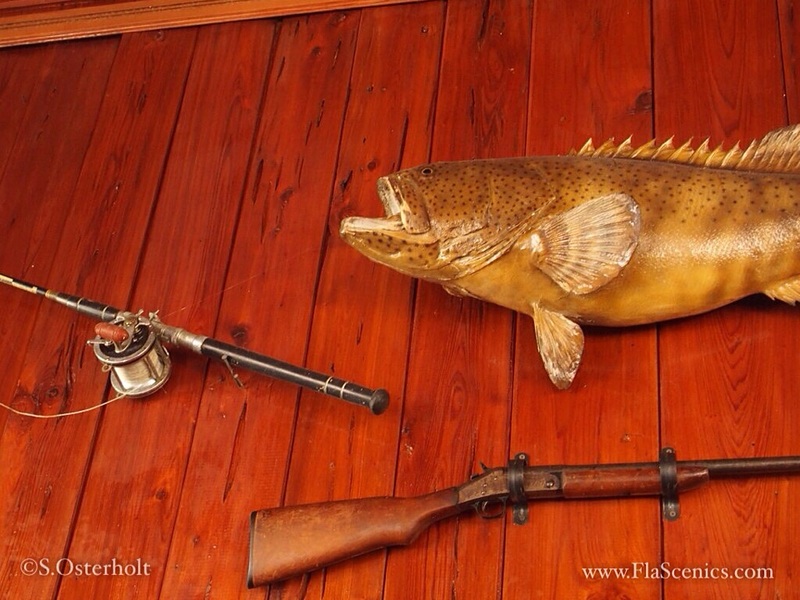 Father Z was not only a huge collector of fishing lures, but also a great fisherman. 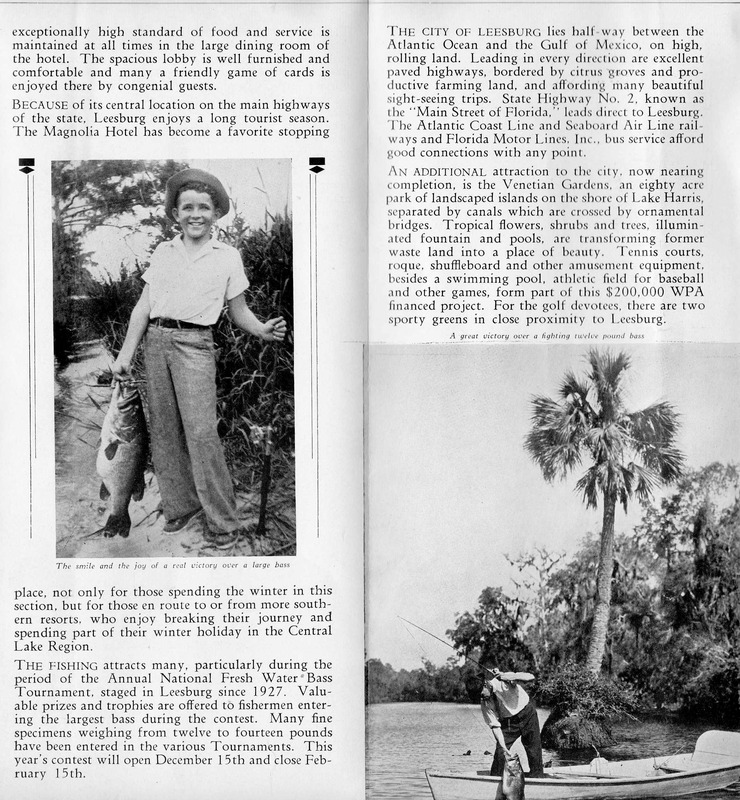 From an article in December 1967 Pensyvania Angler, we find out that he has been fishing for 50 years and still at 84 he was fishing as much as he could on Lake Carey. 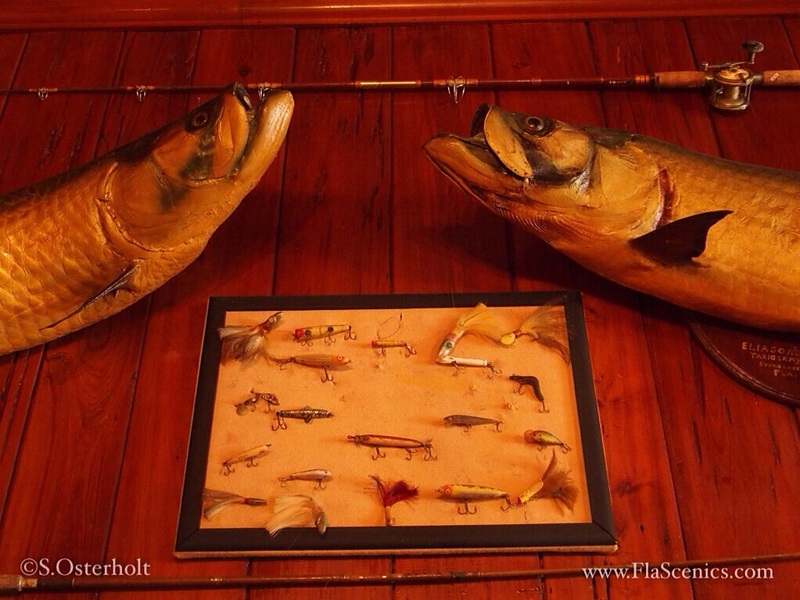 If you are a collector of fishing lures or tackle, I think it is important to pay homage to Father Z for having the passion to pursue a hobby that did not exist at the time, and give us the inspiration to collect and hold on to our fishing heritage! Way to go Father Z! 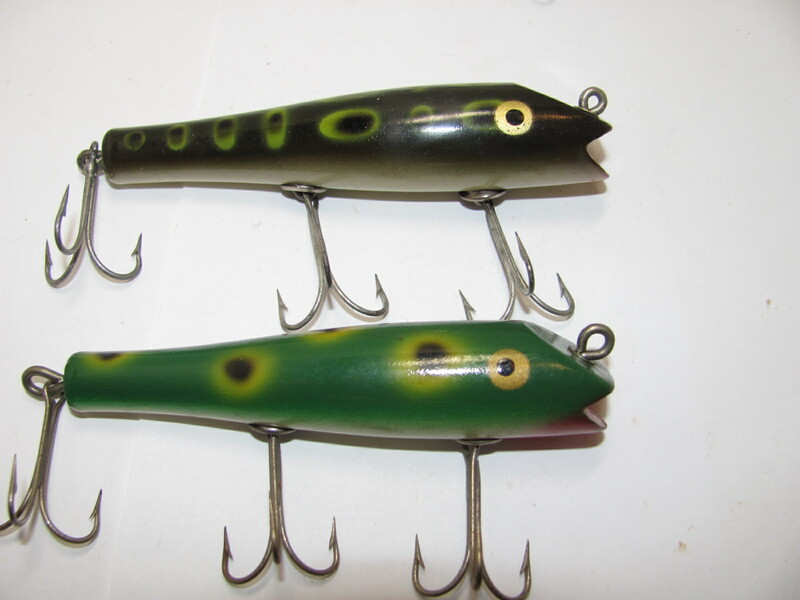 I posted earlier on these under-rated lures, and thought I would add a little bit to my previous post to give you a better understanding on how and why these lures were not as prevalent as their Creek Chub mainline brothers. Let’s take a peek at the production records from the Creek Chub archives, to see how many were produced. 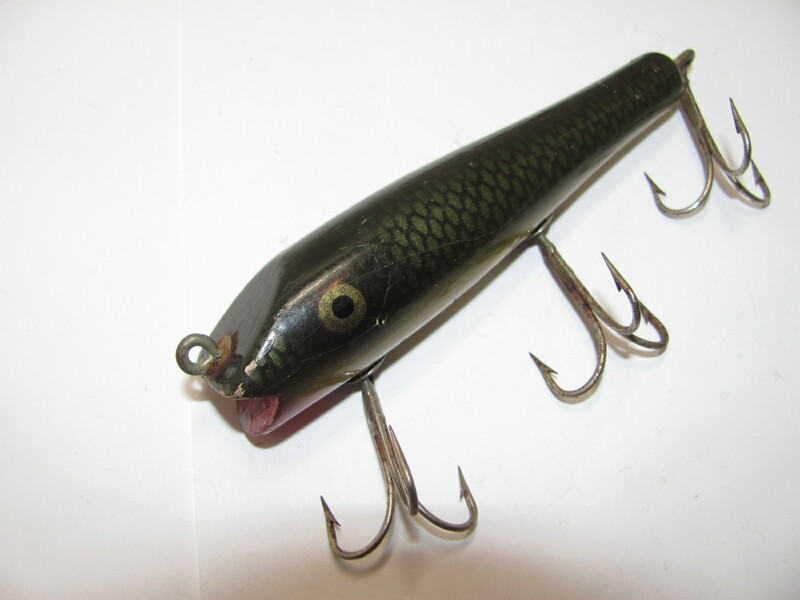 The Shur Strike Darter was produced from 1939-1944, and came back in the 50’s for Montgomery Wards, but just the Frog color from catalogs I have seen. I have production records from 1940-1944, so lets take a look at what was produced during that time span by color. Not surprising, Frog was the dominate color, just like the main Creek Chub line. Keep in mind Frog was available in two shades, a dark green, and a light green frog. 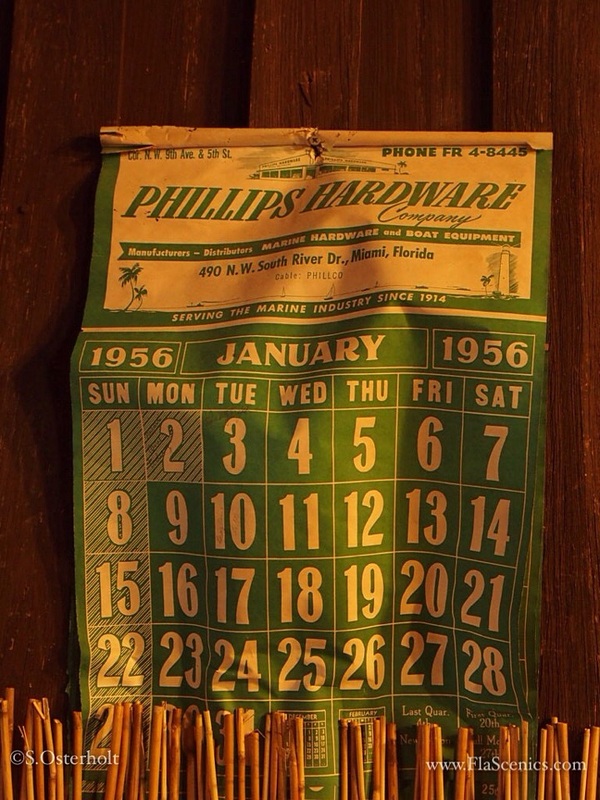 The Dark Frog was earlier and the light Frog was later, and was used when they started selling to Wards in the 50’s. You may wonder why these totals were so low, when Creek Chub produced hundreds of thousands during this span of the main line Darter. I think the biggest reason would be that they did not want to compete against such a successful lure. 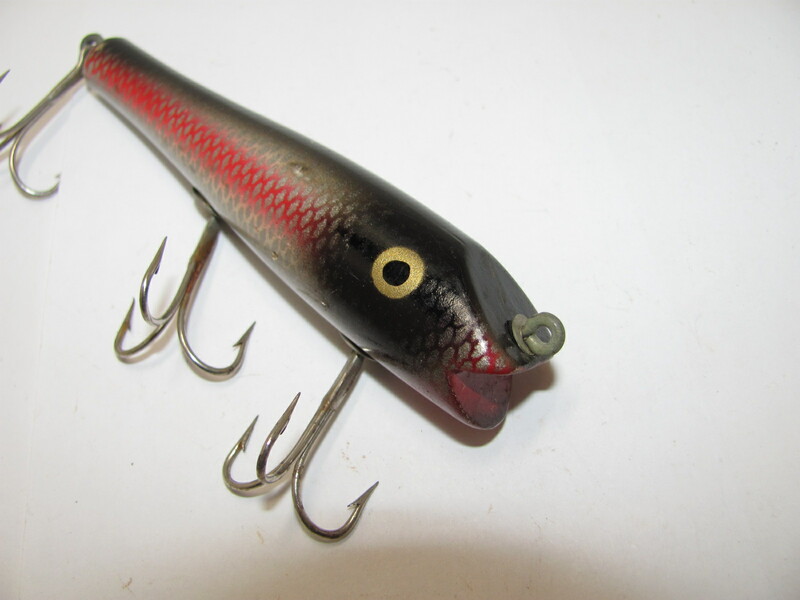 Most of the catalog companies that Creek Chub sold the Shur Strike line, did not offer the Darter. I would assume it was a marketing decision by Creek Chub to sell some of the other styles. The Bass Oreno and River Runt styles did not compete against the main line, and were almost always sold to the retailers and wholesalers. Another reason may be that the Shur Strike style did not work as well, but that discussion will be tabled for a later day. I also wanted to point out that Red and White is really a scarce model to find when you consider that it was very popular in the main line. Perch is also difficult to find, along with Chain Perch, and Red Side. Black and White and Yellow Spotted are listed above, but I have never seen them cataloged. I addressed some of the body style differences in my previous post, but I did want to mention that the flat part of the head can vary somewhat. 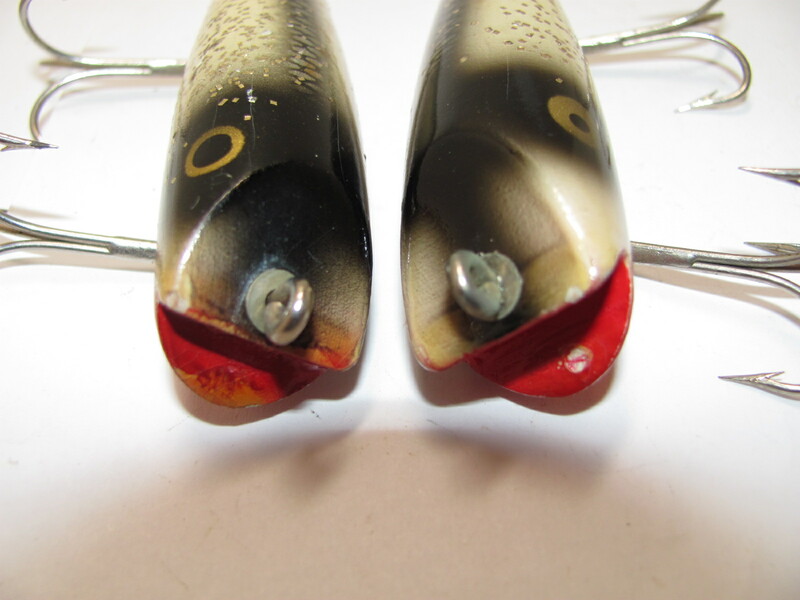 I have two lures that I have found with a more rounded head and have less of the V point head as you can see in the picture below. If you find a Darter in a color that is not listed above, you will have found a real jewel! Keep on the look out, as these are not always properly identified! Here’s a Green Scale I found that I have never seen listed!